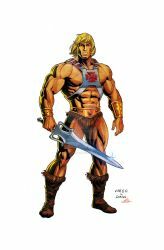 Great work and well done Axel ...all your drawings have a true spirit of MOTU in them its like you are an Eternian yourself. I was wondering if you ever made a drawing of mini comics Whiplash I would love to see your way of doing him, I am sure it would be fantastic ! I loved Red Shadow and Fangor...I am a big fan of the bad guys Evil Warriors, Horde, Snake Men etc. Hola, llegué a tu galería gracias a a entrevista con Javi Olivares. La verdad que es admirable tu arte, tenés un estilo genial y muy propio que hace que tus trabajos se destaquen. Awesome working with you on the pinups man! Great work!! You MOTU stuff is amazing! !Great anatomy and action, superb!! Amazing gallery, my friend! Congratulations and nice to meet you!